Appointments: Tuesdays (8am-8pm), Wednesdays (8am-5pm), and Thursdays (8am-8pm). A Wyoming native, Dr. Sabrina Mentock graduated from the University of Wyoming in 1981, attended medical school at the University of Colorado, Denver Colorado in 1988, and completed her residency training at UNC at Chapel Hill in Family Medicine. In 1992, she started Family Care, PA. She loves her practice of medicine and greatly enjoys the time she can spend with her patients. 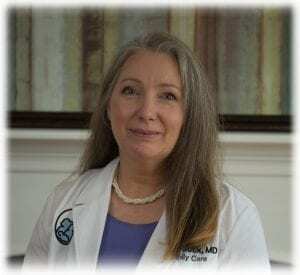 She hopes to help her patients to gain control of their health, by encouraging a healthier lifestyle, reducing stress and maintaining wellness. While she does see all types of patients, both men and women of all ages, her special interests are in women’s health, depression / anxiety, headache and weight loss. Dr. Mentock is married and has three children. Sabrina Mentock, MD is a Primary Care Provider at Family Care, PA in Durham, NC. Family Care, PA has been providing primary care medical services to the Durham, NC community since 1992. Family Care offers a warm, friendly, and comfortable environment for our patients who need to visit their primary care provider. The providers at Family Care focus on developing sustainable long term relationships with their patients and partner with them to achieve their health goals. Currently, Sarada Schossow, PA-C is accepting new patients. If you are interested in scheduling an appointment with one of our primary care providers, please contact our office.